Are you wondering if something is wrong with your brain? Are you ashamed that your brain doesn’t seem to be working as well as other people’s? 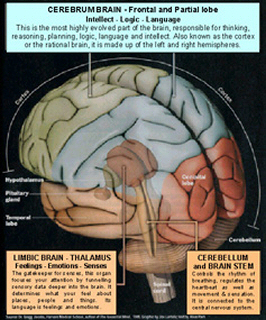 Are you wondering how learning about your brain can help you in psychotherapy.? Are you suffering with ADD, a biochemical depression or anxiety? If you have any of these questions or concerns, this is an important page for you! Our brain is a phenomenal organ that is involved in everything we do. Yes, our brain is a complex and wonderful organ, but, it is still an organ and can malfunction, just like any other. We know that the brain affects how we feel, how we think, how get along with people and how we behave. When your brain is working right, all feels right with the world. When your brain is troubled, you generally experience trouble in your work, relationships, or within yourself. Success in life is associated with how well your brain works. Brain disorders are physical,, as well as mental. Anyone who has had a severe depression, a bi-polar episode, an anxiety attack, ADHD or PTSD, etc. knows that the problem is physical as well as mental. It is estimated that we have 100 billion neurons or nerve cells and trillions of supportive brain cells called glial cells. Each neuron is connected to other neurons by up to 40,000 individual connections between cells. It has been said that there are more neurons in our brain than stars in the universe. Yet, despite this complexity, there seems to be an expectation that our brain will always work perfectly. And, if it doesn’t how is it our fault? Why should anyone carry shame if their brain is not functioning perfectly? Despite its importance and involvement in physical/mental health, we are at the relative beginning of knowing how the brain operates. The field of psychiatry was developed around the observation of behavioral symptoms, not through the study of the brain. This contributed to the arbitrary splitting of mind from body that exists in our health care system today. For example, mental (brain) conditions are reimbursed at ½ the amount of other physical conditions by insurance companies. The stigma that developed around “mental health” problems remains today. Prejudice about brain illnesses is wrong! The separation of brain disorders from any other bodily disorder is arbitrary and false. An explosion is happening in our understanding of the brain. Current technology allows us to scan the brain by SPECT, PET or fMRI machines, which can give you a picture of what is happening inside the brain. They show that some areas might get less blood flow than others; some parts of the brain may be working too hard and some not working hard enough. We are investigating how these differences affect our behavior and our troubles. Certain parts of the brain tend to do certain things. For example, problems in the prefrontal cortex are involved with impulsivity and organization; problems in the cingulated gyrus are involved with rigidity and oppositional behavior, problems in the temporal lobes contribute to mood instability and intense feelings. Once we know how the brain works, the goal of treatment is to balance brain function, such as calm the overactive areas and enhance the under active ones. Understanding psychobiology is critical to taking a new view of psychiatric illness. Brain scans can aid a psychiatrist in verifying a diagnosis, help a person see clearly that s/he has a physical problem that explains symptoms without feeling stigmatized, can aid in medication choices, and aid in choosing specific treatments. Not every one has access to brain scans at this time. This revolution in brain research does not mean we are at the mercy of our brains or that we should turn our brains over to Doctors. It turns out, that what we do, how we think and how we take care of ourselves affects our brain. As we learn more about how the brain functions and what keeps it healthy, we will be able to help millions of people. Medication is only one avenue of help. It has been shown that nutrition, supplements, exercise, our thinking, repeating positive behaviors, and successful processing of trauma or grief also has tremendous influence on brain health. It is my belief that we will someday be able to medically measure the effectiveness of psychotherapy, for instance, by looking at before and after pictures of the brain. The more we know about how the brain works and affects our feelings, thoughts and behaviors, the more we can fine tune our interventions in psychotherapy. One example is that research supports that EMDR has been shown to positively affect the brain of a person with PTSD, post traumatic stress disorder.